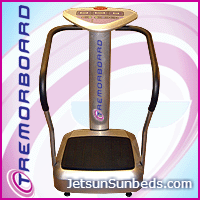 The body responds to Tremor Board vibrations in a truly amazing way! Scientific research has shown that the human body is unparalleled in its ability to adapt to various external stressors and stimuli, and the resulting benefits derived from Vibration Exercise are from that process. The original intended benefit of Vibration Exercise Therapy was increased bone density and muscle strength, but it turned out that the first advantage many users noticed was a dramatic increase in flexibility and range of motion. The quick contractions of muscle fiber not only created flexibility, but also burned fat, increased metabolism, improved circulation, improved cellular oxygen and nutrient delivery which slows the degenerative/ageing process! Also great for cellulite reduction which conventional gym workouts do not target and can also be used to ease arthritis and bone pain. Vibration exercise is also used by professional athletes and footballers for speeding up recovery of injuries. Both single sessions and block sessions include free use of Treadmill.